The first thing I'd like to point out about this chart is that using this technique very little of your traffic comes directly to your site. The majority of it will come through your blog and then to your site. The reason for this is that all of these tactics favor fresh content. Your site, once tuned, will not change very often, but you can add content to your blog as often as you want. With that in mind I will assume you already have a website and will start by talking about the blog. If you are only a blogger the website itself may even be unnecessary. Firefox: There are two tools mentioned in this article that are for Firefox. It's not necessary, but if you use Firefox the time to accomplish these tasks will be greatly reduced. Time: None of my suggestions will cost you money, and it won't take long to execute once you get used to it but you have to be willing to invest some time into getting these things set up and running smoothly. Website Optimized: It helps if you also have already optimized your website for the web with relevant content, meta keywords, descriptions etc. UpCity.com will give you a free report card to help you see where your site is now and get some ideas of how to improve your ranking. Starting a blog is easy. The two most common blogging platforms are Blogger and Wordpress. Both are free, both are search engine optimized, and both have the option of customized templates to match your site or use many freely provided ones. People will espouse the benefits and drawbacks of each, but I have used both and find it quite easy to go back and forth between them. I am running Blogger here as a subdomain of my site, while some of the sites I contribute to are on Wordpress. Make sure your blog has prominent links to your website, and it's best if it has the same look and feel, the same logo etc. It should be seamless for people to traverse from your blog to your site. Once you have a blog the key is to post something as often as possible. It's ok if some of them are just quick notes and others long articles. Always start with an introductory paragraph and an engaging image or video (in any order) and then use the "more" link so that the entire post doesn't appear on the main blog page. Always use Tags/labels/keywords (verbage varies but all are the same) that are relevant to the entry. The last thing about blogs is subject matter. Consider your target audience and what they would like to read. As a photographer I try not to write pieces on my own blog that would only be of interest to other photographers, but instead find subjects that would be of interest to potential clients. I don't follow that for every single post, but it's a dominant thread for me. Unless you've been living under a rock you know what Facebook is which is currently the most popular social media site. You may even know that you should have a "Page" for your company or organization. What you may not know is that it is not the only social media site around or what to do with that page once it's created. I'll break down a few of the main ones, but you may want to look into specific others that are particularly beneficial to you (for example in the photography industry Flickr and Model Mayhem are worth considering). Once upon a time there was Friendster. This was quickly and completely usurped by MySpace, which was later quickly and completely usurped by Facebook. I'm often surprised by the number of people that think Facebook was revolutionary but it is certainly the most successful of them and at this point it's pretty difficult to avoid. As an organization you need to have a page. Make sure you choose the right category for it, upload your logo and any other relevant media and use whatever means you can to get people to "like" the page. Twitter is probably the second most important social networking site out there and every organization should have a twitter account with their name. The keys to success on Twitter are 1) regular posts that include tags (#photography) and mentions (@sander_martijn) and 2) to have a large amount of followers. The primary way to get a lot of followers is by following people. Unless you're a celebrity or major brand name that people seek out, I typically see about a 1/3 return on this (Follow 300 and about 100 will follow back). Your return will be better if you follow people that would be interested in what you have to say than if you just follow anyone you can. Building this up in the first place can be tedious, but fortunately there are options for making this more efficient. The one I like to use is Tweepi. Using this site I can put in the name of someone that already has a lot of followers similar to the ones I want and then follow their 20 at a time. It also has other options such as to unfollow people that don't follow me back. Of course you want to give time for that, so I will leave a minimum of 2 weeks between logging into Tweepi and then I will start by unfollowing a bunch before finding a list of people to follow. This way the number of people I am following stays reasonable while my reach grows quickly. Of course this shouldn't replace manually following people you actually are interested in and keeping your twitter links prominent so others can easily follow you, but it is a way to grow your twitter netweork quickly and efficiently. Many underestimate the value of LinkedIn. The difference between LinkedIn and other social networking sites is that it is geared towards professionals. Little or no content on LinkedIn is about anything other than professional topics and it is highly centered around groups that focus on specific topics. It may not have the same reach as Facebook and Twitter, but those you are talking to are very relevant professionals that are looking for your information and willing to recommend it to others. It also tends to be an older more educated and affluent group of people. Other than that it works very similarly to Facebook. I have made many long term professional connections on LinkedIn. I highly recommend taking advantage of the clarity and focus of this networking site. Google+, or G+ has yet to make big waves and has struggled to compete with Facebook. However it does have some interesting things about it and Google has suggested that they will soon use some of their muscle to give it relevance. I suggest creating an account in this network and posting to it so that if and when it becomes relevant you have already built a history on it. That said I wouldn't spend too much time on it until it does. One last note about Google+. It has been shown that Google is prioritizing G+ links in search. Even if you don't have anyone looking at your posts there it will help your Google rank. Ok so you've created all these social network pages, what do you do with them now? Well other than consistently growing them, you need to post relevant information on them regularly that draws them to your website and blog. The most important one is to post on all of them every single time you put up a blog post. This could be very time consuming but fortunately there are solutions for this too. I've tried a few out, but the one I really like is Yoono, and in particular the Firefox sidebar (they now also support Google Chrome but I haven't tried it yet so can't comment). Once you've installed it you enter the username and password for each of the social networks you use that it supports and then it just sits there on the left side of your browser waiting for you to click share. 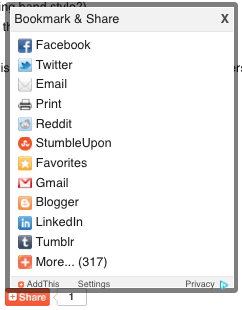 Go to your blog post and click share, then click "This page" on the top. Choose the most relevant image from your post, add a description (you can use tags and mentions if you'd like for twitter), and click share. Your post is instantly shared across all of these networks. I currently have it set up for Facebook, Twitter, LinkedIn and Myspace (I mentioned MySpace as irrelevant earlier, but since I already have a myspace account and it's seamless I figure why not). There are two main current limitations of Yoono. First it does not yet support G+. For this I just click on the toolbar in the bottom of my post that I mentioned in the blog section of this article. The second is that the facebook currently only supports posting on your personal Facebook, not on your organization's page. I haven't found a solution for this other than going to my page and adding it myself. I, and probably many others have asked for these to be added. Still it's a huge time saver. Viral media works a bit differently from social media. The best news is that you don't have to build a network. After signing up and selecting categories that interest you you're pretty much done. When you post to a viral media system you include a short description and one ore more categories or tags and it shows your post or site to other people that have expressed interest in these categories. If some of those people then say they like it the system shows it to more people, and so on. A successful post works like a Fibonacci sequence, where 5 becomes 25 becomes 125 etc. With almost no effort you can reach a huge target audience that may have never heard of your organization otherwise. The primary function of a newsletter is not to gain new viewers but to convince prior viewers to return to your site. For some organizations it is very important to send out regular newsletters that inform people what you've been doing and what you intend to do in the coming months. For others this is not important at all. I'm somewhere in between, I might send out an emailed newsletter once or twice a year. I use phpList to do it but there are many systems and services that you can use for this. My main advice for this is to never add people to your list without their request or knowledge and never buy a list. Also note that while it may be important to your recurring visitors, email newsletters have a very low clickthrough rate due to spam and overflowing inboxes. If you decide it's important to have a newsletter by all means do so, but these days it is not nearly as powerful as all the other components I have listed. Everyone knows you need to be able to be found in search engines, particularly google. Well here's the really great news. All of the advice above will help your search engine rankings. If you have an optimized site and regularly post new content and share across these various networks, your search engine ranking will go up on its' own. You don't have to do anything more. It probably took you a while to read through all of this, and it will take you some more time to set all of these up and get in the habit of using them. However once you get the hang of it they will become automatic for you and the only time consuming part will be thinking of things to write about or share and doing so. Spreading the word about it becomes second nature, and it's well worth the investment. Here are links to all the resources listed in this post. Work through them to get your marketing efforts working for you.